dear wine - your day is coming! dear anthony - we need to get you driving more. I going to need your help. Hopefully this summer you will be driving full-time. dear risa - it's really ok. It will all work out. Can't wait for NYC. Next year we should go back and work! You never know. dear craftcation...I will be in Cali attending your awesome conference is less tha 13 days - whooohoooo! 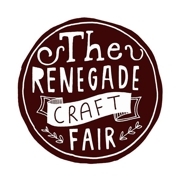 dear renegade craft show - FINALLY! I get accepted to one of your awesome shows. I hope I don't spend more than I make. It's going to be AWE----SOME! Congrats on getting accepted into Renegade! One of my goals this year is to apply to a large craft fair. I'm super nervous to do it though. Stopping by from Friday's Letters. I have never been to a craftcation, sounds like so much fun. Congratulations on being accepted to Renegade, I hope you sell out fast so you have time to shop. :-) Happy Weekend.